Certificate of Discipleship Training Level One. Certificate of Discipleship Training Level One In CHINESE. Certificate of Discipleship Training Level Two. This set of study lessons is not a complete study in any of the fields of study, but nevertheless we believe that this set of study notes cover most topics that are required for a new Christians. This booklet is only an introductory to more develop studies and it is hoped that from these lessons that the new Christian will develop a hunger to study the Word of God more deeply. At Traillblazer Ministries we believe in teaching students a Firm Foundation of the Word of God. It is not enough just to see people become Christians, we need to develop our approach to people. Although the born-again experience is the greatest miracle that we will see, we need to take things further by bring teaching of the word of God that will set a person on the right path. Matthew 13:47 Again, the kingdom of Heaven is like a net that was cast into the sea, and gathered some of every kind; 48 which, when it was full, they drew to shore, and sat down and gathered the good into vessels, but threw the bad away. As in building a house we need to set the foundation on the rock of Jesus Christ, so that the new convert can eventually grow to maturity. 1/ Read the Word of God. Hebrews 10:23 Let us hold fast the profession of our faith without wavering (for He is faithful who promised),Heb 10:24 and let us consider one another to provoke to love and to good works, Heb 10:25 not forsaking the assembling of ourselves together, as the manner of some is, but exhorting one another, and so much the more as you see the Day approaching. After we have established these three important factors into the hearts and minds of new converts, we should encourage them to get involved in an ongoing Bible study, with the aim of setting a good foundation in them for their Christian walk. As servants of God are given a job, and that is to catch people with the love of Christ, by the teaching of the Word of God. But once we have done this, it is not the end of a process but the beginning of a life in Christ. Would any of us who have had a child, cast that child away and say, “Look after yourself”? No, because we know that the child is too small to take care of itself and soon it would die. We, as Christians who have had some care and love shown towards us in our early walk with Jesus need to understand, that newborn Christians are like the little baby. We are called by God to help in the development of the new Christians so they don’t wander back to the World. Therefore we have developed this set of teaching and placed them on this site for you to use and follow with the hope you will continue your study in the word of God and grow in strength. Once we are saved, we all need Bible studies that are in reach of our understanding. 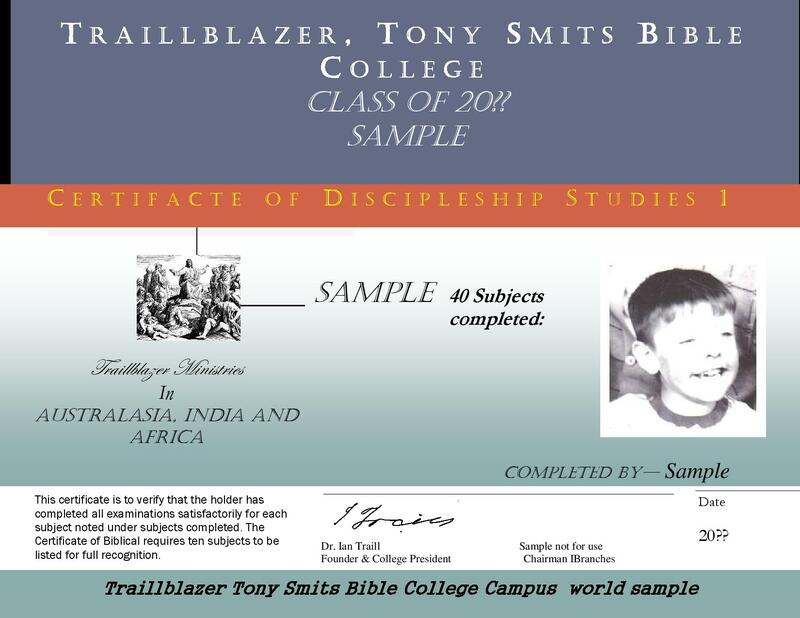 This set of notes dovetails into a course conducted by Tony Smits of the CRC Australia in addition to lead into Vision Christian College, Sydney Australia. We conduct this through Traillblazer Ministries in different locations. There is no limit to any person who wishes to study the Word of God. You can study all your life and you will find more as you delve deeper into His Word. The young Christian may have many questions over a wide range of subjects. The purpose of this booklet is to secure the young Christian into the body of Christ with a basic understanding of how the Word of God is relevant to his or her life. A Christian who doesn’t study the Word of God will not be able to live to the fullness of what God has promised to him or her. The enemy is trying to steal away our peace, and finally destroy us, hoping we will turn away from God. Here we see we are to study His Word, to be approved workers, which is right, but let us look at the second part of this statement. handling the word of truth with precision. The word precision has an implication of importance and we need to know how to handle it in our defence against the enemy. We need to understand the Word of God clearly, so that we can extinguish the fiery arrows of the enemy. Now if you agree with me, you see the importance of studying the Word of God. Let me make some suggestions on how to use this book. Each study has a set of questions and you should write them in your study book. The individual and the group leader may use this booklet for studying His word. a) The individual should take some time in prayer, before asking the Holy Spirit to open to you revelations about His Word. b) You will need your Bible when studying these studies. Why? Because you will need to check up on me to see what is written is in accordance with the Word of God. You are responsible for your walk with God. c) You will need to make some notes as you are studying; therefore you will need a pencil and a notebook. I would also recommend that you write your revelations in your Bible. 1) For group leaders open with a time of pray and or worship. 2) You could do these lessons over a period of one year taking two weeks or more for each study as you see fit. 3) It is beneficial to have group discussion about the topic, but leaders must take a few hours to study the notes to gain personal revelation before the meeting. 4) A leader is to lead, but if you are only reading the notes at the same time as everyone else, you have not studied and found yourself approved. 5) Again everyone should have his or her own Bible, Pencil and notebook. Finally this booklet is only a suggestion on studying. If you have nothing of your own to share, this material can be a resource for you to use. But please consider the topics of the booklet, because these topics are essential for a young Christian in regards to a healthy development in the Word of God. May our Lord Jesus put a fire in your bones and that one day through you many will come into His Kingdom.